Having returned from Rouen on Sunday night it was full speed ahead getting ready to go to CSI2* Keysoe on Thursday morning. Marine Delanoe and her lovely horse Emie are now based with us and came to Keysoe with us, so we had a time for a little bit of training, which seemed to go very well, and Kvint and Emma just had a little jump to make sure they felt happy before we went. Having had unseasonably warm weather at the beginning of the week we arrived at Keysoe in a howling gale and freezing cold temperatures. Marine arrived before me and found our stables which were in a nice temporary barn and not too wet! Although Kvint managed to find enough mud in the stable to have a lovely roll in his show rug while we were bedding the stables down. With Marine's excellent help we managed to get set up pretty quickly, have a quick sandwich and a cup of coffee and then get them all ridden and trotted up. The show was very full, with a very high class entry, with the added attraction of a wildcard to the Liverpool International Horse Show on offer. Friday morning started with young horse classes and then Marine's 1.20 class. Marine and I are very new to one another and I know I'm not always the best communicator and so there were some glitches in preparation for this class leading to a few sat-nav problem, However, Marine and Emie actually jumped very well and we made a better plan for Friday. Kvint jumped a lovely round in the 1.20 apart from when I totally missed him in the jump-off - how I did it remains a mystery - even after watching the video - I think we just had a major communications breakdown. We then had a long gap before Emma jumped in the 1.40. Trevor Breen walked the course with me which was a great help for a very technical class in a fairly small arena. Emma jumped a great round, just having the first part of a double of uprights. There was a very committed, wide and square oxer off the corner at three, and then three quite short strides to the double and she jumped in very big and then was just a bit tight as she took off. However, she jumped really well and finished 16th and gained one point towards the Liverpool Wild Card - which was certainly a surprise. Saturday dawned unbelievably cold, which made everybody feel very tucked up and miserable. Marine and Emie jumped a very good and fast round in the 1.15 just having the last fence which denied them a good placing. But a great round nevertheless. Kvint then jumped a lovely round in the 1.25 to just have the last fence as well and then we had another fairly long wait for Emma to jump the 1.45. One of the problems I had both in Rouen and Keysoe was not being able to find out where the harrow break in the class fell before I got Emma ready, which meant that she was out for a bit too long before she jumped. She is always hot, but sometimes she is not quite rideable enough and this was one of those days. She just had the second fence which was a big stile off the corner and the middle of the combination, but certainly made the size of the fences seem easy which was encouraging. Sunday was cold again and with five jump-off classes before the Grand Prix it was always going to be a long old day. 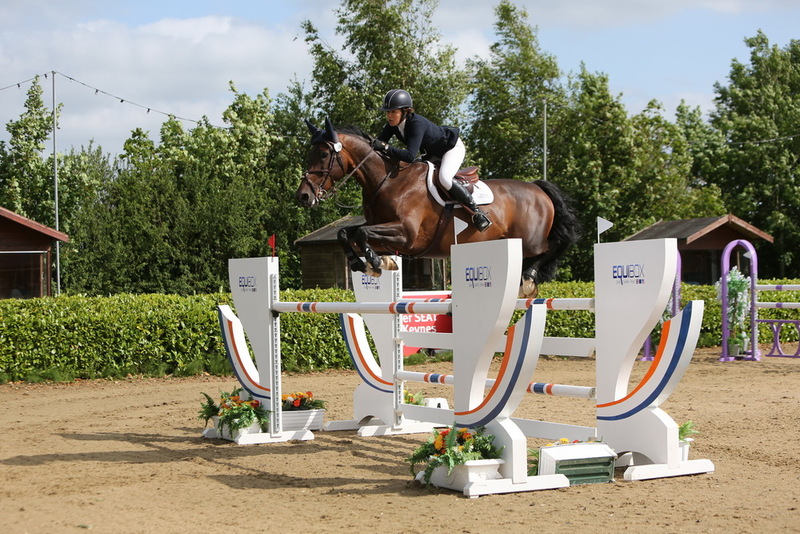 Marine jumped well in the 1.15 final and was unlucky to have a couple of poles. But it looked good and we have plenty of time to for fine tuning before the spring shows. Kvint jumped a super clear in the 1.25 final but with 33 out of 85 going clear we had to try to go as fast as we could, he tried so hard over the biggest fences he has every jumped, and just had two down. He is such a lovely, easy horse and always tries to please. 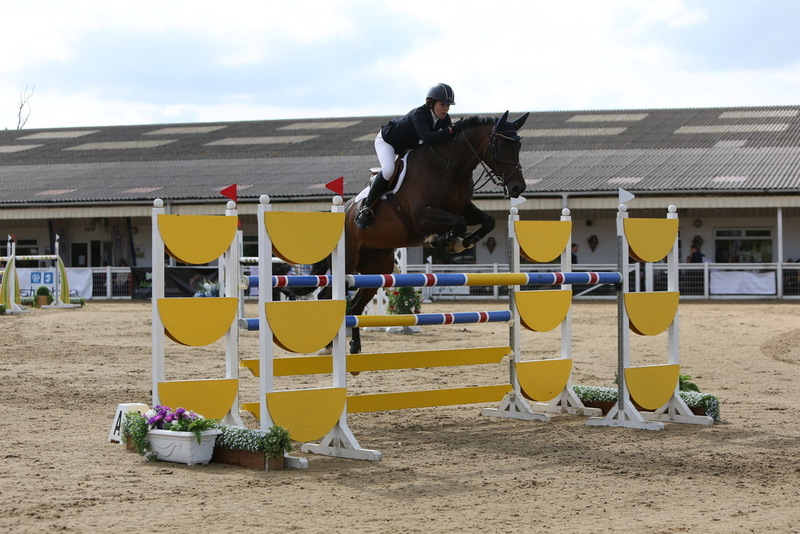 Next was the 2* Grand Prix, which having a published start time of 2.30 started at 6.30. That is a long, cold wait! Trevor walked the course with me again, and was really helpful. This seems to be a good formula for me as he is so calm, and doesn't seem to think the fences look big at all! I was a little bit disorganised myself, as I had somehow thought I was 40th to go and was actually 22nd which meant Marine, Andy Sinclair and I had to tack her up in super speedy time. Although it would be impossible to recommend this as a calming preparation, it actually worked very well, she warmed up relatively calmly, and felt quite obedient and in we went. She jumped the most fabulous round and just turned a little bit left over the last fence and caught it with her inside hind toe. I was so thrilled with her - what a blast, she gives such a feel over every fence, such a super little horse who gives her all in every round. So we finished the show without a single prize, but with five world ranking points and a great round in our first world ranking class to finish 16th. I packed up and paid as quickly as I could and arrived home at 11.30. Poor Marine had a puncture on the M25 so didn't get home to us until 1.00 am with 9 O'clock lectures on Monday - horrible! Marine is now course building in Belgium, and then is off to course build at Hartpury and Olympia so Camilla, Steff and I are going to be busy keeping Emie ticking along. Both Kvint and Emma are having a quiet time until mid-January with occasional hacking, lunging and turn-out so that they don't lose all their fitness, but they feel fresh and ready for work when they need to. They both seem to have come out of Keysoe feeling very well and fresh and they will enjoy doing something low pressure and fun. If Wednesday morning was anything to go by I might not enjoy taking Emma on Ashdown Forest that much - she certainly kept my bingo wings toned as we trotted up the hills. Heidi has been very good this week and Sarah and Simon Travis helped me give her a jump yesterday - I think we might be ready for a bit of clear round jumping at Felbridge next weekend if the snow doesn't beat us to it. Doonaveeragh Emma 1.30 and 1.35 Keysoe CSI2* - Click on the photo for the slideshow - the photo deal at Keysoe was unbelievable in that they gave you all your photos for the same price as just a few. The CSI2* at Keysoe is one of my favourite English shows of the summer. The team at Keysoe led by Sarah Watson always put on a great show with great hospitality and a good summer holiday feel to it. The excellent courses built by Kelvin Bywater and commentary from Steve Wilde complete the big show atmosphere. The hard work of the previous two years certainly paid off this year with large and very high class fields in all the classes. After Hickstead I gave both Emma and Luendi a quick jump at Pyecombe to make sure they were feeling confident and then it was off to Keysoe. This year I had fantastic stables in the permanent block so the girls had lovely beds and rubber mats and I didn't have quite so far to walk. The show and their sponsors gave a lovely champagne reception to get things off to the best possible start and I started jumping in the 1.15, first class on Thursday with Luendi. She just made one babyish mistake but jumped very well. Doonaveeragh Emma was late to jump in the 1.30 in the afternoon so she had a quiet hack round the lovely cross country course before jumping very well for 4 faults over a strong track. The big class of the day was won by Tracy Priest and Millfield Ultymate. Luendi jumped well again on Thursday morning and Emma was fantastic in the 1.35 and would have jumped clear without the rider making a hideous mistake at the 3rd last! Even with 4 faults she finished well into the top half of the class. 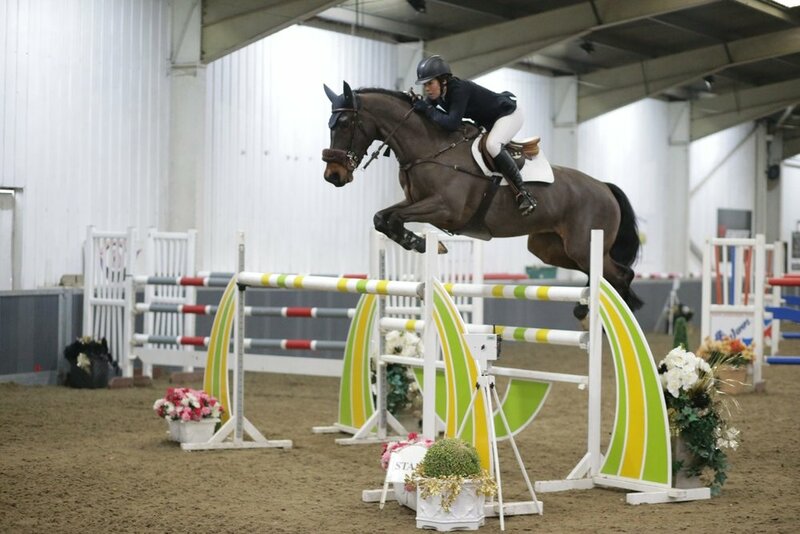 I decided to step Luendi up to the 1.25 for Friday as she was used to the ring and hadn't been at all spooky. She just had the first fence when she was looking at something else and I slightly over-rode the double, but otherwise she jumped absolutely beautifully. I jumped Emma in the same class as a confidence boost for her. She jumped very well, but was a bit quick into the combination, not a mistake she makes over a bigger fence and maybe she should have jumped in the 1.35 instead, but it is nice for her not always to have try so hard. I was really lucky to have help from Bina Ford during the show. An expert pair of eyes at the practice jump are invaluable, especially with Luendi who is maturing and changing all the time at the moment. Another show with no prizes, but very valuable experience gained both for Luendi for whom every show is completely different, and for Emma and I jumping bigger courses. I felt distinctly rusty at that level of competition - not the height of the fences, but the intensity of an international show that is somehow different to a national show. I stayed to watch the fantastically competitive grand prix and then set off for home, a long old journey with the afternoon traffic on the M25 to contend with. It was wonderful to come back to find that Steff had painted the inside of Emma and Luendi's boxes, all part of the seemingly endless job of keeping the yard smart and tidy from year to year. The lorry is now all ready to start packing to leave for CSI1* Le Mans on Wednesday afternoon. We have had a quiet couple of days and spent a very happy Saturday evening helping Trevor Breen celebrate his second consecutive Equestrian.com Hickstead Derby win. Mark has started riding Luendi as part of his fitness training for our very exciting riding Safari holiday in November.